Identification: Distinguishing characteristics were provided by Rauchenberger (1989a) and Page and Burr (1991) (although the latter authors treated the two forms as subspecies). These two species were long considered subspecies of G. affinis, and were only recently recognized as separate species (Wooten et al. 1988; Rauchenberger 1989a; Robins et al. 1991a). Complicating matters of identification, most introductions occurred before the recent taxonomic change; furthermore, the origins of introduced stocks were usually unknown or unreported. In addition, both forms were widely available and thought to have been dispersed widely by humans. As a consequence, it often is not possible to determine if many of the earlier records represent introductions of G. affinis or of G. holbrooki. Native Range: Gambusia holbrooki is native to Atlantic and Gulf Slope drainages as far west as southern Alabama; G. affinis occurs throughout rest of the range (Rauchenberger 1989a; Page and Burr 1991). Table 1. States with nonindigenous occurrences, the earliest and latest observations in each state, and the tally and names of HUCs with observations†. Names and dates are hyperlinked to their relevant specimen records. The list of references for all nonindigenous occurrences of Gambusia holbrooki are found here. Means of Introduction: Because of their reputation as mosquito-control agents, both G. holbrooki and G. affinis have been stocked routinely and indiscriminately in temperate and tropical areas around the world. In the United States the first known introductions of mosquitofish took place in the early 1900s (Krumholz 1948). In 1905 about 150 G. affinis were introduced into Hawaii from Texas to test their effectiveness in preying on mosquito larvae (Seale 1905), and by 1910 their descendants had been released into parts of Oahu, Hawaii, Maui, Kauai, and Molokai (Van Dine 1907; Stearns 1983). Also, in 1905 Gambusia, reportedly from North Carolina, were released into New Jersey waters for the purpose of controlling mosquitoes (Seal 1910; Krumholz 1948). Mosquitofish were commonly and widely introduced during the following decades by such organizations as the former U.S. Public Health Service, in large part because they were thought of as an effective and inexpensive means of combating malaria (Krumholz 1948). In more recent years, employees of many state and local health departments apparently view the use of mosquitofish to control mosquito larvae as an attractive alternative to the use of insecticides. In some areas range extensions have occurred through natural dispersal far from sites where originally introduced (e.g., Pflieger 1997). 97). Status: Established in most states where stocked outside its native range. Its establishment and spread in northern states is greatly restricted because the species are not, in general, cold tolerant. In most cases, overwintering in colder regions requires surfacing groundwater springs (e.g., Woodling 1985; but see Lynch 1988b). Established in Nebraska, although the populations suffer heavy (up to 99%) winter mortality (Haynes 1983). Pflieger (1997) noted that Gambusia affinis is more widespread and abundant in Missouri now than it was half a century ago. For instance, Pflieger indicated that, by the early 1980s, it had become established northward along the Mississippi River to Clark County, Missouri, and westward near the Missouri River to Andrew County, a range expansion attributed to a combination of natural dispersal and undocumented introductions. Impact of Introduction: According to Courtenay and Meffe (1989), mosquitofish have had the greatest ecological impact by far of any of the introduced poeciliids. Although widely introduced as mosquito control agents, recent critical reviews of the world literature on mosquito control have not supported the view that Gambusia are particularly effective in reducing mosquito populations or in reducing the incidence of mosquito-borne diseases (Courtenay and Meffe 1989; Arthington and Lloyd 1989). 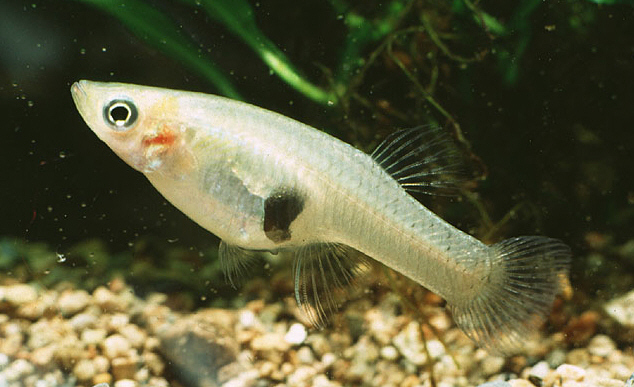 Because of their aggressive and predatory behavior, mosquitofish may negatively affect populations of small fish through predation and competition (Myers 1967; Courtenay and Meffe 1989). In some habitats, introduced mosquitofish reportedly displaced select native fish species regarded as better or more efficient mosquito control agents (Danielsen 1968; Courtenay and Meffe 1989). Introduced mosquitofish have been particularly destructive in the American West where they have contributed to the elimination or decline of populations of federally endangered and threatened species (Courtenay and Meffe 1989). Specific examples of their negative effects include a habitat shift and a reduction in numbers of the threatened Railroad Valley springfish Crenichthys baileyi in springs in Nevada (Deacon et al. 1964) and the local elimination of the endangered Sonoran topminnow Poeciliopsis occidentalis in Arizona (Moyle 1976; Meffe et al. 1983, Meffe 1985). Western mosquitofish use the same habitat as the plains topminnow Fundulus sciadicus and have displaced these topminnows and other species with their aggressive behavior (Whitmore 1997). The mosquitofish is also responsible for the elimination of the least chub Iotichthys phlegethontis in several areas of Utah (Whitmore 1997). Meffe (1983, 1985) found that mosquitofish are very aggressive, even toward larger fish. They often attack, shred fins, and sometimes kill other species. Mosquitofish are known to prey on eggs, larvae, and juveniles of various fishes, including those of largemouth bass and common carp; they are also known to prey on adults of smaller species (Meffe 1985; Courtenay and Meffe 1989). Courtenay and Meffe (1989) listed impacts on a variety of native fishes. Introducing mosquitofish also can precipitate algal blooms when the fish eat the zooplankton grazers (Hurlbert et al. 1972), or in an increase in the number of mosquitoes if the fish eat the invertebrate predators (Hoy et al. 1972). Introduced fishes, including mosquitofish, are likely at least partially responsible for the decline of the Chiricahua leopard frog Rana chiricahuensis in southeastern Arizona (Rosen et al. 1995). Mosquitofish, and other introduced poeciliids, have been implicated in the decline of native damselflies on Oahu, Hawaii. Often the distributions of the damselflies and introduced fishes were found to be mutually exclusive, probably resulting from predation of the fish on the insects (Englund 1999). Remarks: Summaries and reviews of mosquitofish introductions were provided by Krumholz (1948), Hardy (1978), Courtenay and Meffe (1989), and Dill and Cordone (1997). The identity of some mosquitofish populations introduced into selected areas is correctly known. In most cases this is because the source of the stock was reported. The western mosquitofish, G. affinis, has been documented as introduced into Arizona (Dees 1961; Miller and Lowe 1967); California (Dees 1961; Moyle 1976; Swift et al. 1993; Dill and Cordone 1997); Florida (Chick, personal communication; Williams, personal observation); Hawaii (Stearns 1983); Illinois (Krumholz 1948; Dees 1961); Indiana (Dees 1961); Kansas (Dees 1961; Cross 1967); Massachusetts (Dees 1961); Michigan (Dees 1961); Missouri (Dees 1961; Pflieger 1997); Nebraska (Lynch 1988a, 1988b); Nevada (Miller and Acorn 1946; Dees 1961); New Jersey (Dees 1961); New Mexico (Dees 1961); New York (Dees 1961); Ohio (Dees 1961); Pennsylvania (Dees 1961); Utah (Rees 1945; Dees 1961); Washington (Dees 1961); and Wisconsin (Dees 1961). Gambusia holbrooki was introduced into New Jersey (Fowler 1952) and into Tennessee near Knoxville and maybe to other locations as well (Starnes, personal communication). Both species have been introduced into Alabama (Boschung 1992). Shapovalov et al. (1981) indicated that both species were introduced into California, but Swift et al. (1993) argued that G. holbrooki never has been taken in the state and probably never was stocked. There was even mention that a hybrid between the two species was released into California waters (Dill and Cordone 1997). In their recent tome on fishes introduced into California, Dill and Cordone (1997) related their strong suspicions that pure Gambusia holbrooki had been introduced into that state. They based their conclusion, in part, on the importance and size of the mosquito control program in California, and the central role mosquitofish played in those attempts. However, Dill and Cordone did admit that there was no real proof that G. holbrooki became established in the state. In some cases Gambusia stocks native to a particular region of a state were moved within the same state, in Virginia for example (Jenkins and Burkhead 1994). In contrast, Krumholz (1948) reported that mosquitofish from southern Illinois, where the species is native, were introduced into northern Illinois, an area outside its native range. Hubbs and Lagler (1958) reported that intergrades between G. affinis and G. holbrooki have been introduced into southern Michigan, but the stock did not become established. Galat and Robertson (1992) found that the Yaqui topminnow P. occidentalis sonoriensis occurring in some sites increased their fecundity in response to the presence of introduced Gambusia; however, the researchers noted that such habitats must also have certain environmental conditions (e.g., uniform temperatures) for maintenance of vigourous P. o. sonoriensis populations. Galat and Robertson concluded that conservation of some extant populations of P. occidentalis depends primarily on control of Gambusia. Arthington, A.H., and L.N. Lloyd. 1989. Introduced poeciliids in Australia and New Zealand. Pages 333-348 in G.K. Meffe and F.F. Snelson, Jr., editors. Ecology and evolution of livebearing fishes (Poeciliidae). Prentice Hall, Englewood Cliffs, NJ. Danielsen, T.L. 1968. Differential predation on Culex pipiens and Anopheles albimanus mosquito larvae by two species of fish (Gambusia affinis and Cyprinodon nevadensis) and the effects of simulated reeds on predation. PhD dissertation, University of California, Riverside. Deacon, J.E., C. Hubbs, and B.J. Zahuranec. 1964. Some effects of introduced fishes on the native fish fauna of southern Nevada. Copeia 1964:384-388. Meffe, G.K. 1983. Attempted chemical renovation of an Arizona spring brook for management of the endangered Sonoran topminnow. North American Journal of Fisheries Management 3:315-21. Meffe, G.K. 1985. Predation and species replacement in American southeastern fishes: a case study. Southwestern Naturalist 30:173-87. Meffe, G.K., D.A. Hendrickson, and W.L. Minckley. 1983. Factors resulting in decline of the endangered Sonoran topminnow Poeciliopsis occidentalis (Atheriniformes: Poeciliidae) in the United States. Biological Conservation 25(1983):135-159. Myers, G.S. 1967. Gambusia, the fish destroyer. Australian Zoology 13(2):102. Stephen, B.J. 2004. The mosquitofish problem. Nebraska Land. 82(4): 36-37. Ward, F. 1931. Notes on the food and parasites of the mosquito fish (Gambusia holbrooki) in Florida. Trans. Am. Fish. Soc. 61: 208-214.